Spend 7 nights enjoying the sensational views of the ocean! 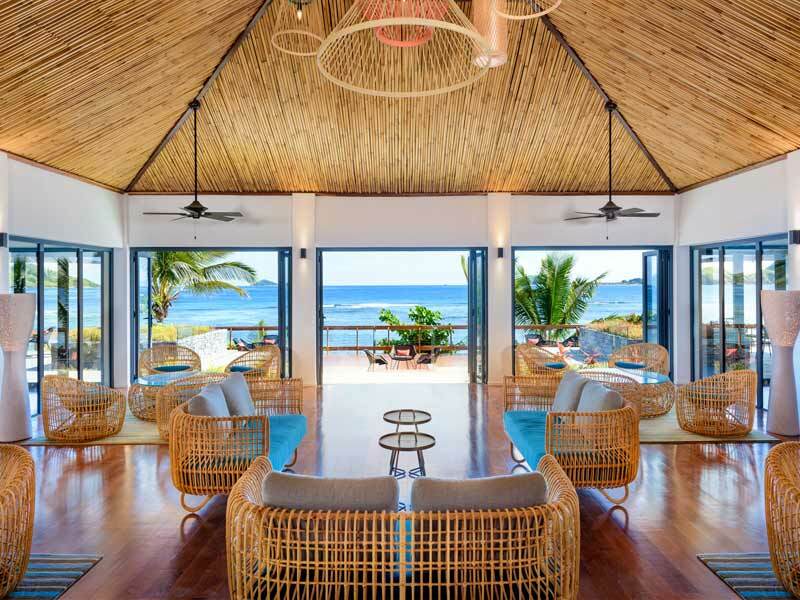 Equipped with air conditioning, TV, private indoor and outdoor living areas, these rooms offer couples and families the perfect escape during their Fiji holidays. 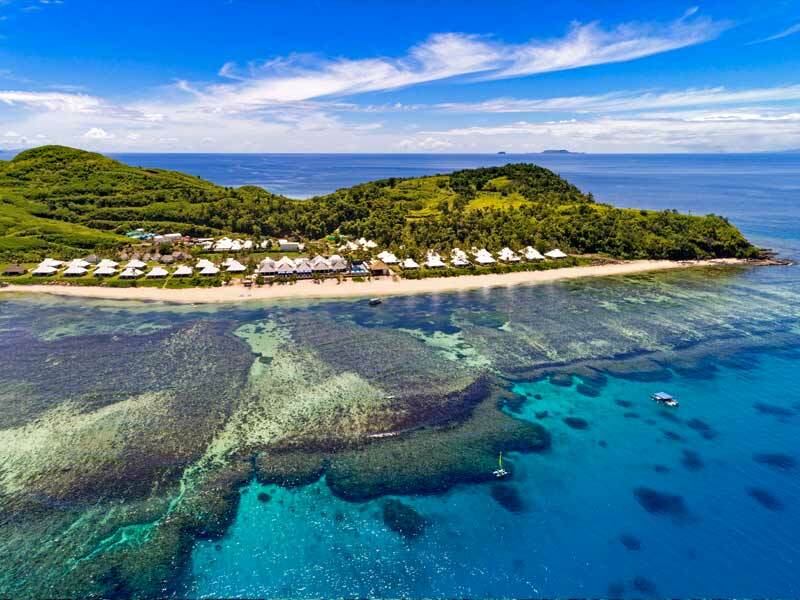 The quickest, easiest and most scenic way to arrive at a resort is by air travel, and in this exclusive My Fiji package, you will experience an incredible helicopter ride at the beginning & end of your holiday! No day needs to start the same with a buffet breakfast at Waitui House Restaurant! 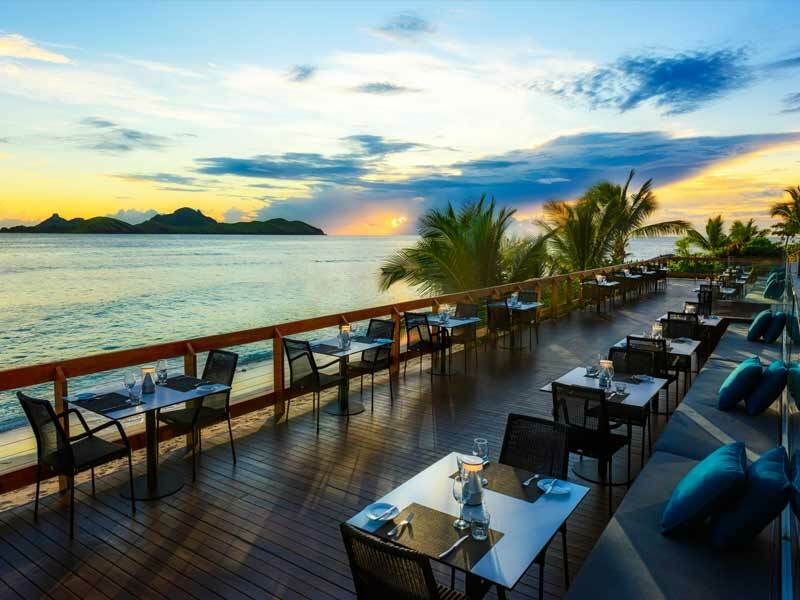 Feast on a selection of mouth-watering international favourites and gaze across the ocean, every morning of your stay! 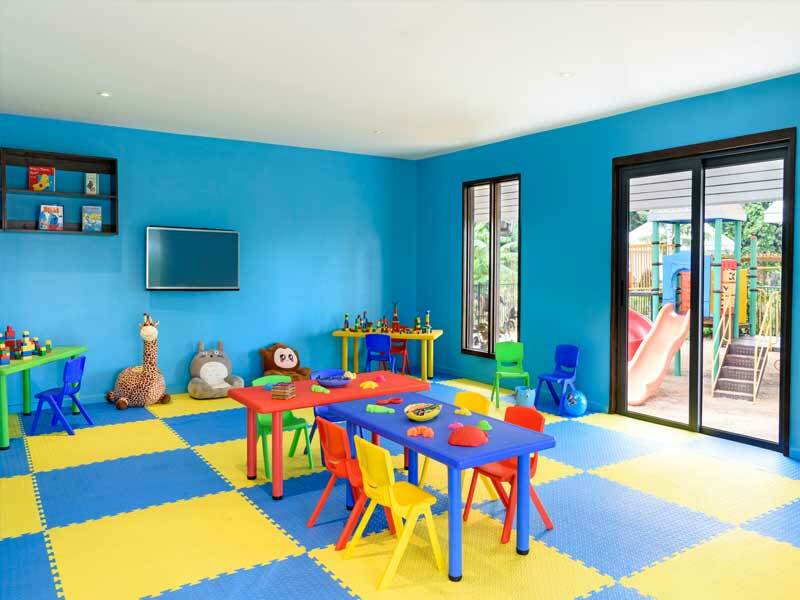 Keep the kids entertained with complimentary daily access to the kids club for the duration of your stay! Make the most of everything that the resort has to offer! Stay connected with complimentary WiFi in public spaces and guest rooms; Play a round of mini golf; Chill out in the games room which features table tennis, foosball and a pool table; Take part in the daily activities schedule which includes cultural demonstrations; Enjoy a movie theatre screening with the whole family each night, plus more! 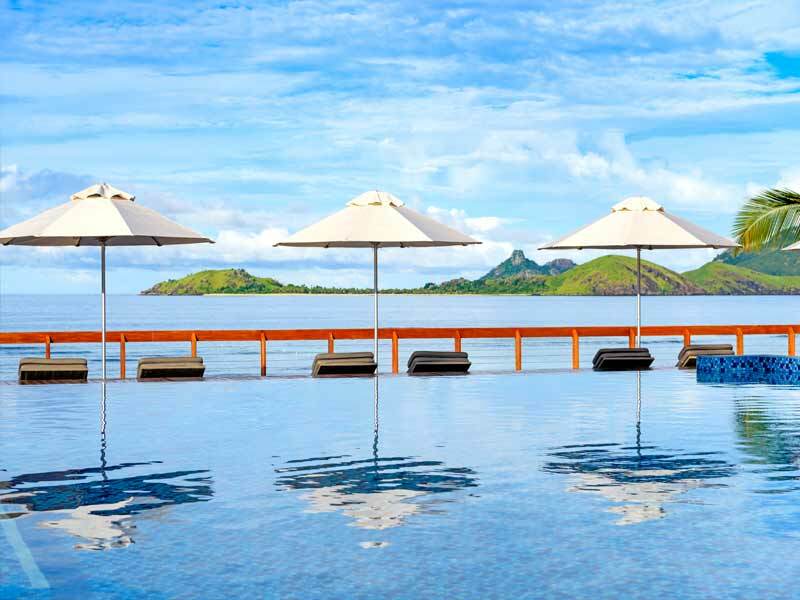 Save up to $200 on this My Fiji package when you travel on select dates in May or June ex SYDNEY only. Valid for sale until 30 April or until sold out! Get in quick. * Subject to availability at time of booking. Valid ex Sydney only flying with Jetstar and valid on select departure dates. Offer not valid on all resort partners, contact us for more information. 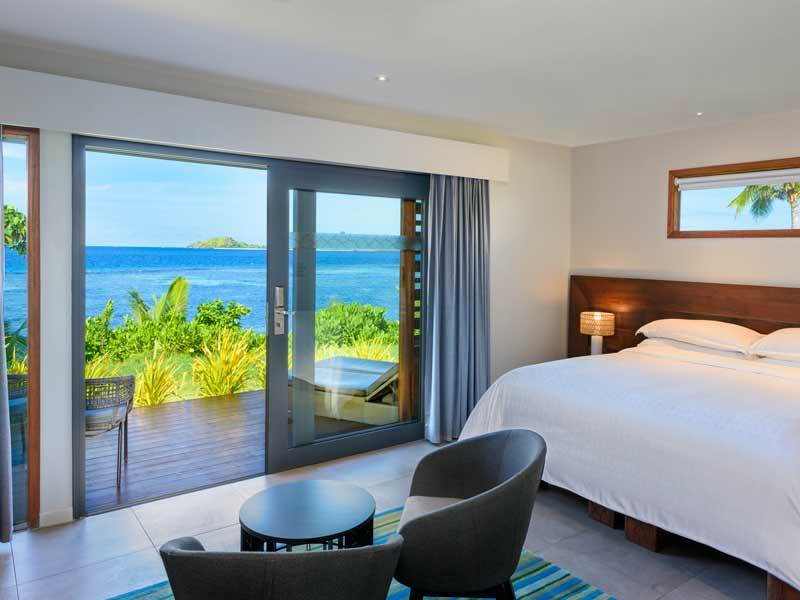 Equipped with ceiling fans, air conditioning, TV, private indoor and outdoor living areas and sensational views of the ocean, the Ocean View Rooms offer couples and families the perfect escape during their Fiji holidays. With 35sq. metres of space you won’t be cramped for space or style in these rooms! Some interconnect with an Island Family Suite for larger families and groups. There’s a king sized Sheraton Sweet Sleeper bed that can be changed to two king singles if you prefer and the spacious bathroom features a rainfall shower head. Beachfront Room – UPGRADE from only $300 per person! 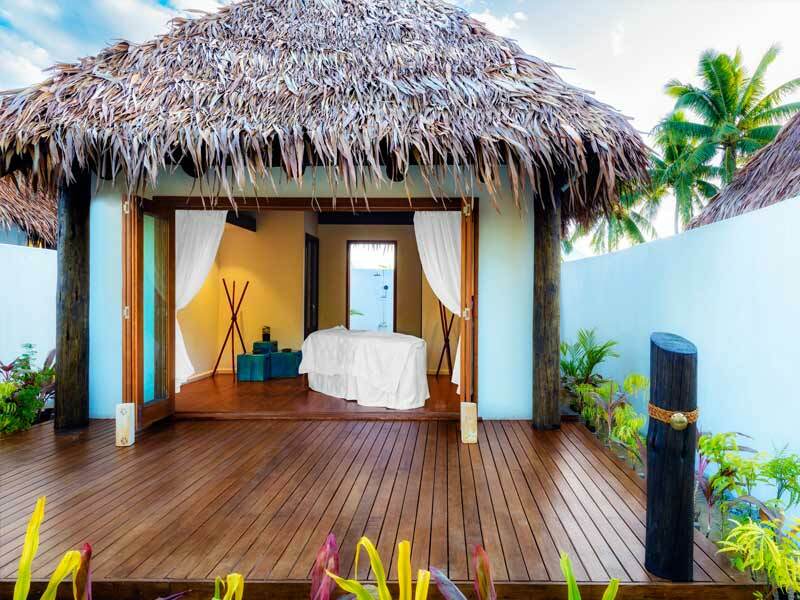 The Beachfront Rooms are situated just steps from the blue waters of the ocean and are constructed with Fijian style and Sheraton comfort. A private deck ensures privacy as you drink in your uninterrupted beachfront views. The interior boasts 40sq. metres of space with king sized Sheraton Sweet Sleeper bed (or two king singles If you prefer), a comfortable sitting area and a spacious bathroom with rainfall showerhead and dual vanities. The Beachfront Rooms also feature modern luxuries including air conditioning, Wi-Fi access, TV, in-room safe and more. 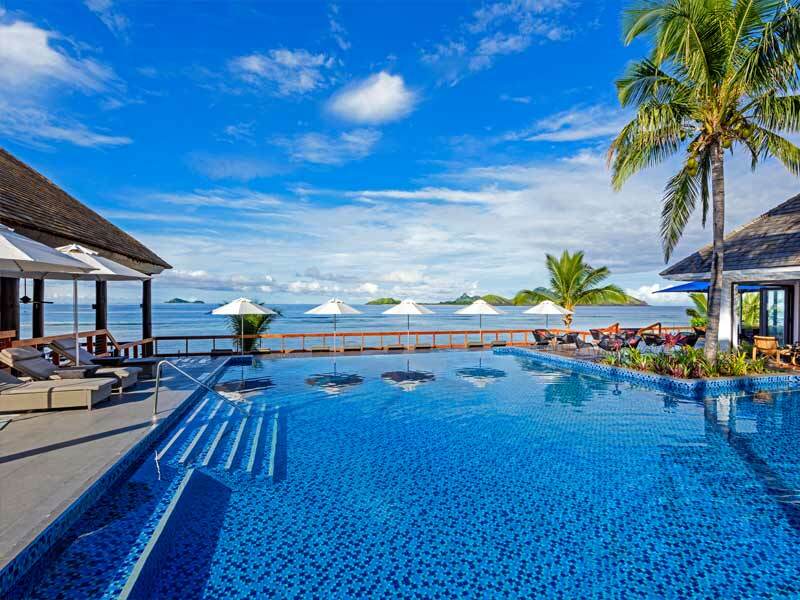 Tokoriki Ocean View Retreat – UPGRADE from only $300 per person! The Tokoriki Ocean View Retreat is perfectly suited for couples seeking escape and romance. These retreats are located on the adults-only side of the resort so you can peacefully enjoy the stunning ocean and Mamanuca Island views from the private deck or plunge pool with less than 40 metres separating the retreats from the beach. The interior spans across 40 to 50sq. metres and features a king sized Sheraton Sweet Sleeper bed (or two king singles if you prefer), a spacious bathroom with a rainfall showerhead and dual vanities, air conditioning, ceiling fans, outdoor daybeds, Wi-Fi access and more! Please note: Guest must be 18 years and older to stay in the Tokoriki Ocean View Retreats. 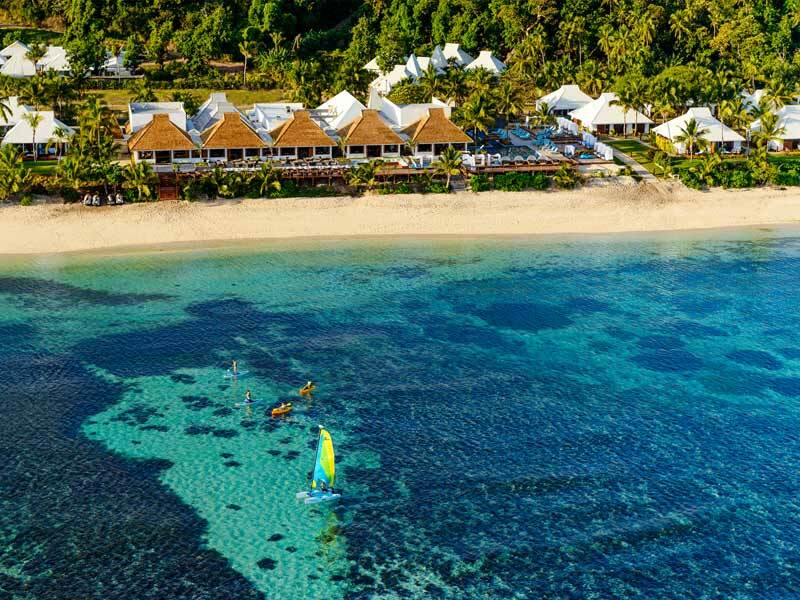 Tokoriki Beachfront Retreat – UPGRADE from only $1000 per person! As accommodation designed and equipped specifically for adults, the Tokoriki Beachfront Retreats offer couples a private and comfortable stay. With 42sq. metres of living space the Tokoriki Beachfront Retreat is complete with a king Sheraton Sweet Sleeper bed (or two king singles if you prefer), spacious bathroom with rainfall showerhead and dual vanities, air conditioning, Wi-Fi access, TV and a living area. Step outside onto the furnished private deck where you’ll find the private plunge pool, an outdoor day bed and picturesque views of the beachfront. 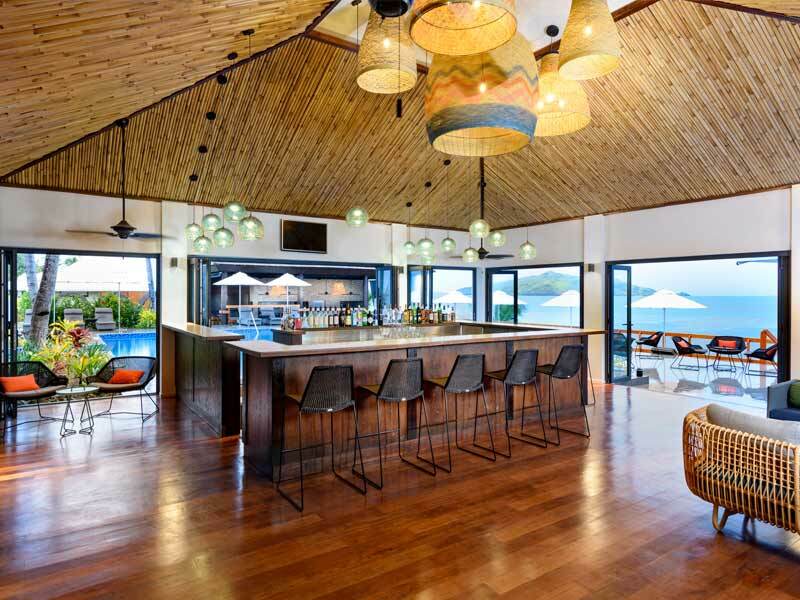 The Tokoriki Beachfront Retreat is located in the adults only area of the resort so guests must be 18 years or older to stay in these retreats. 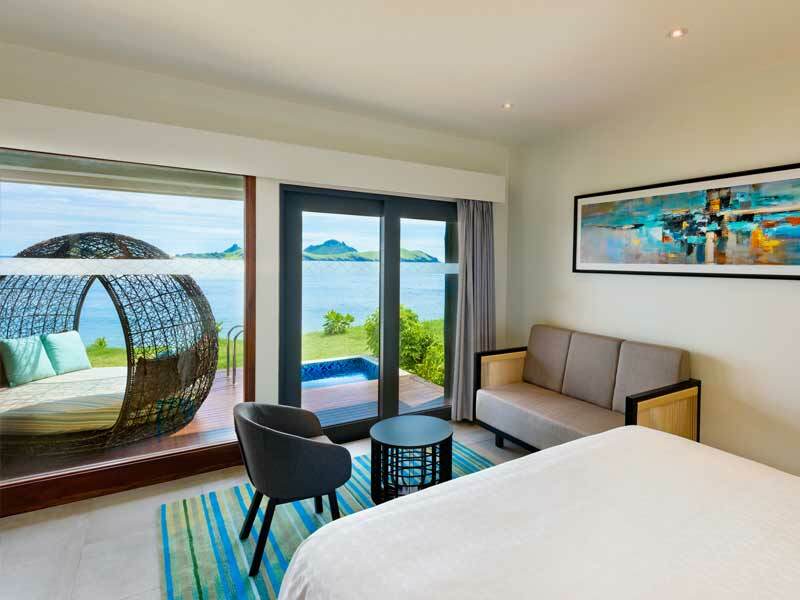 Island Family Suite – UPGRADE from only $1300 per person! Spacious (53sq. metres) and comfortable, with amenities like flatscreen TV, Wi-Fi and air conditioning, the Fijian-inspired Island Family Suite will suit everyone’s needs. Up to 4 guests can be comfortably accommodated in these suites with a king sized and 2 king single Sheraton Sweet Sleeper beds. Larger families can opt for the Island Family Suite that interconnects with an Ocean View Room for bedding for an extra 2 guests. Only 55 metres from the beach, guests can relax on the private deck while overlooking the tropical gardens and hillside. 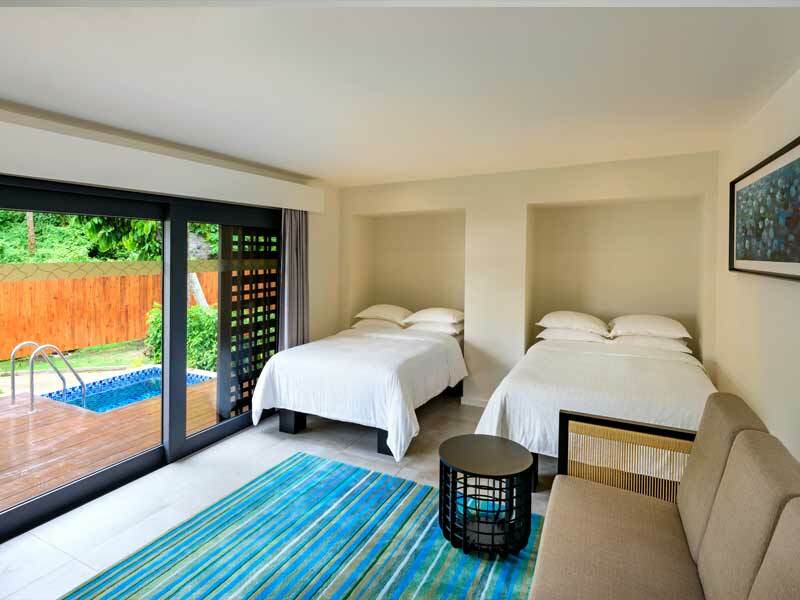 Island Family Suite with Plunge Pool – UPGRADE from only $1550 per person! The 53sq. 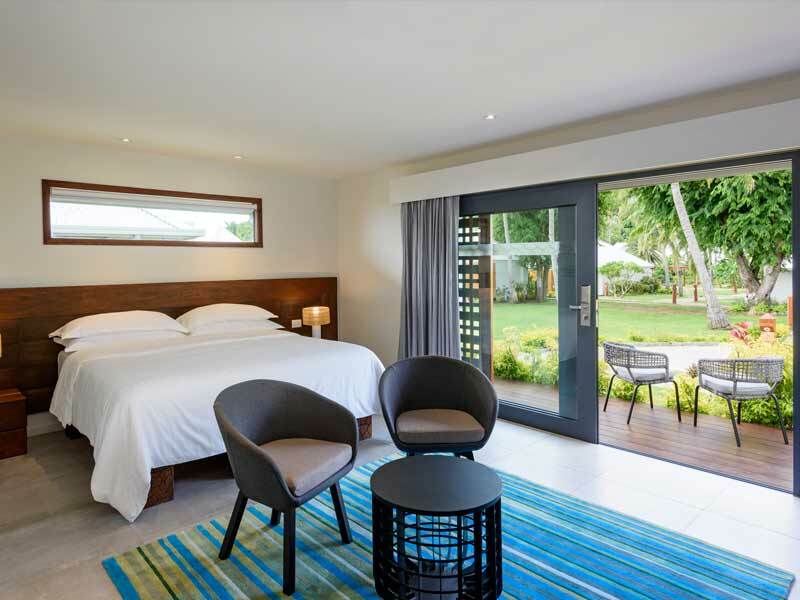 metre Island Family Suites with Plunge Pools are spacious and can comfortably accommodate up to 4 guests with the king sized and 2 king single Sheraton Sweet Sleeper beds. Need more space? Request an Island Family Suite with Plunge Pool that interconnects with an Ocean View Room for an extra 2 guests! The interiors are equipped with air conditioning, ceiling fans, TV, living area, separate bedroom and a spacious bathroom with rainfall showerhead and dual vanity. 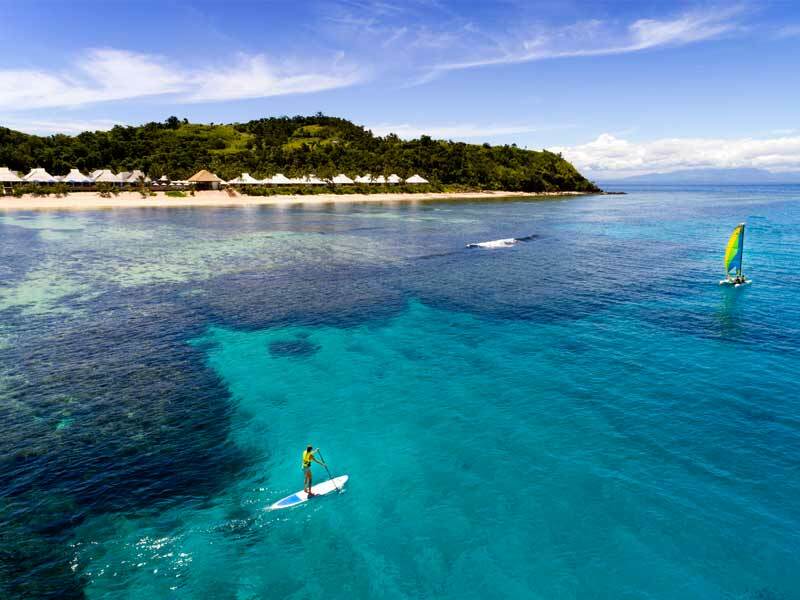 Get to know Fiji’s Mamanuca Islands from Sheraton Resort & Spa Tokoriki Island! 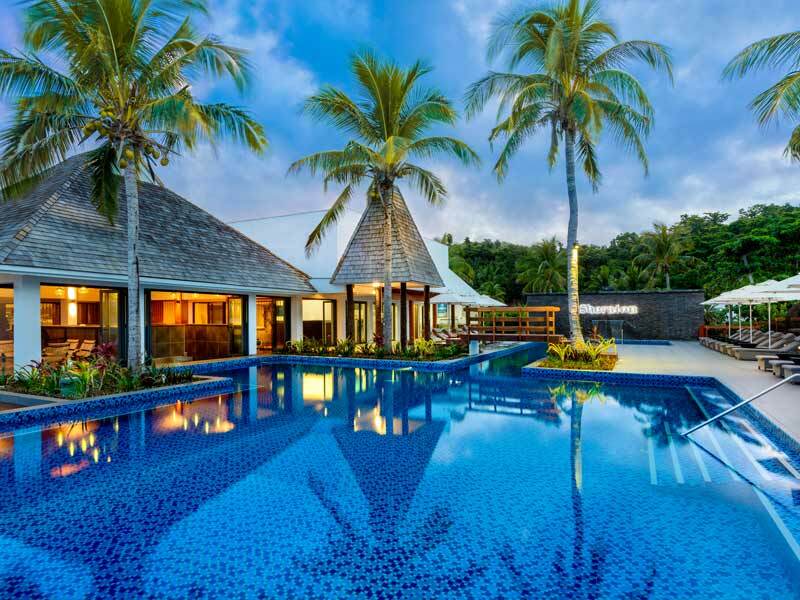 This tropical oasis has recently undergone a multimillion dollar renovation which is evident the moment you arrive at the resort. 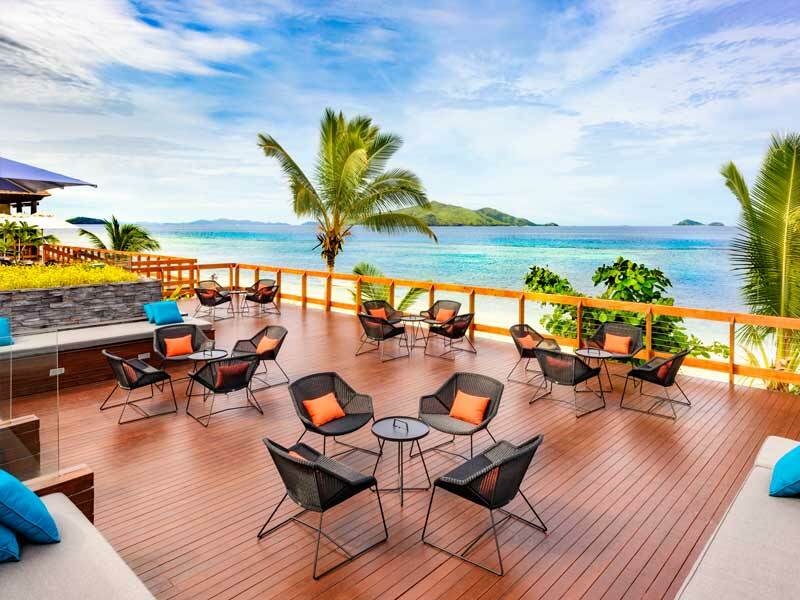 Combining ultimate luxury and tropical Fijian ambience, the Sheraton Resort & Spa Tokoriki Island is perfect for everyone! 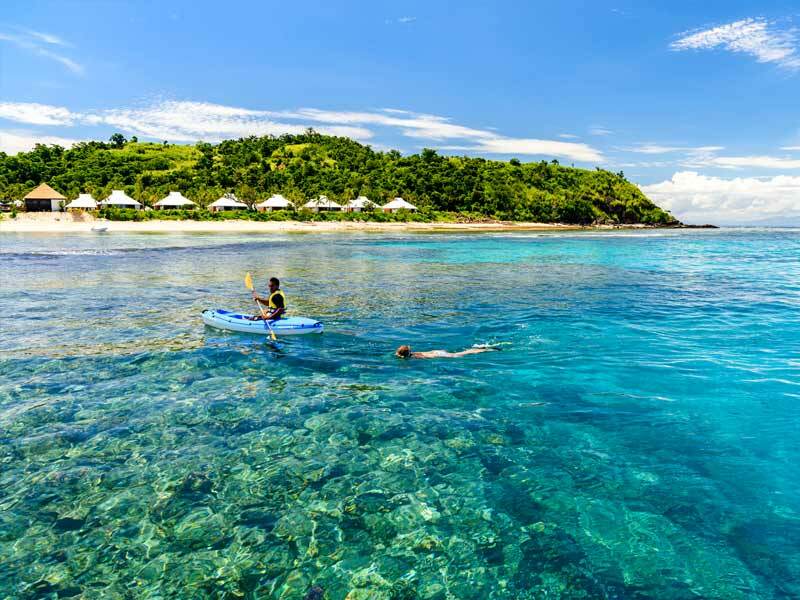 Click here to read more about Sheraton Resort & Spa Tokoriki Island! #Kids play for FREE: For accommodation: Most rooms have a capacity of two people only. An infant (2 years & under) is permitted in a Baby Crib/Cot per room except the Tokoriki Retreat Rooms. Families with more than 2 people can be accommodated in either Island Family Suites or Interconnecting rooms. For dining: Children aged 0 – 3yrs dine complimentary. Children aged 4 – 12yrs receive 50% off food prices and may also have a Children’s Menu to order from or eat from the buffet however each child must be accompanied by a paying adult. For play: Children aged 4 – 12yrs receive complimentary daily use of the Kids Club for the duration of their stay (maximum of 2 children). Children under 4 years of age or children requiring special needs must be accompanied by a guardian or adult. Additionally, a full evening program is available with the Kid’s Club at the cost of F$25 per child per evening and includes a set children’s menu for dinner. ~Helicopter Transfers: The quickest, hassle free and most scenic way to arrive at a resort is by air travel. Our check-in desk is situated at the domestic counter in Nadi Airport. All passengers connecting from International arrivals at Nadi Airport will be met and greeted by a Pacific Island Air representative. * If any service is affected by poor weather or other unforseeable events which are beyond the control of Pacific Island Air which results in passengers needing alternative transport or not being able to utilise booked service, no refund will be provided. It is highly recommended that clients have travel insurance to cover any such events. A letter will be given to disrupted clients for their insurance provider. 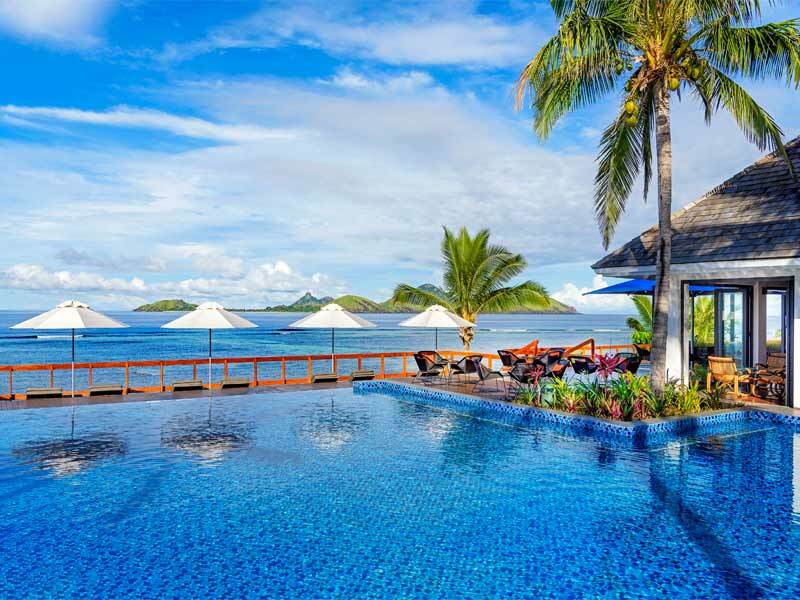 Same day airport to island resort connections and reverse connections depend on the arrival and departing flight times to/from Nadi Airport. All transfers are subject to weather conditions at time of arrival. Should adverse conditions prevent operation the client is responsible at their own cost for their own additional accommodation wherever it may be and/or alternative travel arrangements not organised by the Company. Accommodation in Nadi or Denarau may be required if your international flight arrives outside of Helicopter transfer operating hours. This is not included in the package price. If you would like to know more please speak to your My Fiji specialist. 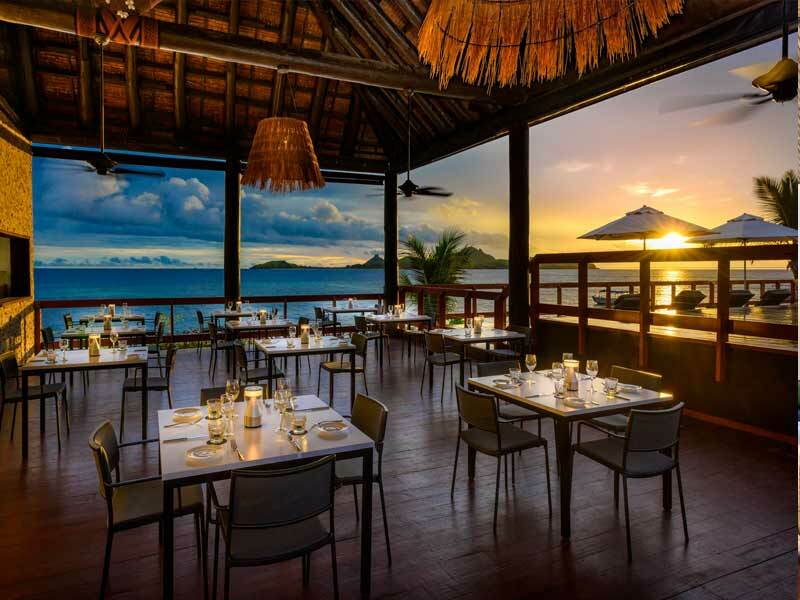 *Wine, Dine & Spa Credit: * FJD$1000 credit per booking to be used at hotel-owned bars, restaurants, Tokoriki Retreat Spa @ Sheraton Resort & Spa Tokoriki Island or room service. Note, the credit cannot be used at any non-hotel owned F&B outlets, resort gift shops, merchandise stores or toward any watersports/activities. 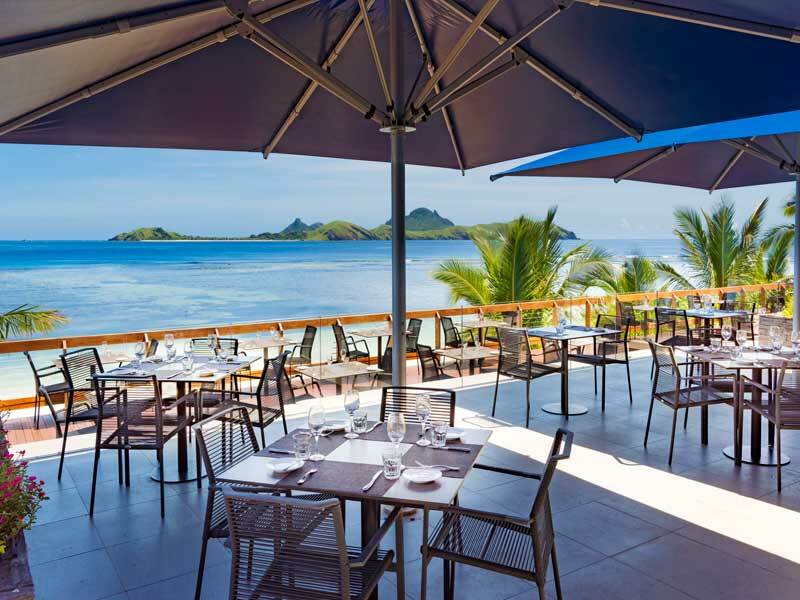 * No voucher is required for this special, but we ask that MyFiji make all parties aware of the terms & conditions of use of the credit. * Not applicable on split stays. * Credit cannot be shared with or transferred to any other hotel room account. * Credit applicable for use at hotel-owned bars & restaurants, Tokoriki Retreat Spa @ Sheraton Resort & Spa Tokoriki Island and room service. * Credit cannot be used at any non-hotel owned F&B outlets, resort gift shops, merchandise stores or toward any watersports/activities. * IMPORTANT: If the resort credit value is exceeded, the additional amount will be payable on checkout. Any unused credit upon checkout cannot be redeemed for cash or held in credit.